Are you looking for a unique milestone birthday gift that’s sure to be a hit? Then look no further – this striking personalized keepsake canvas print is a guaranteed winner! 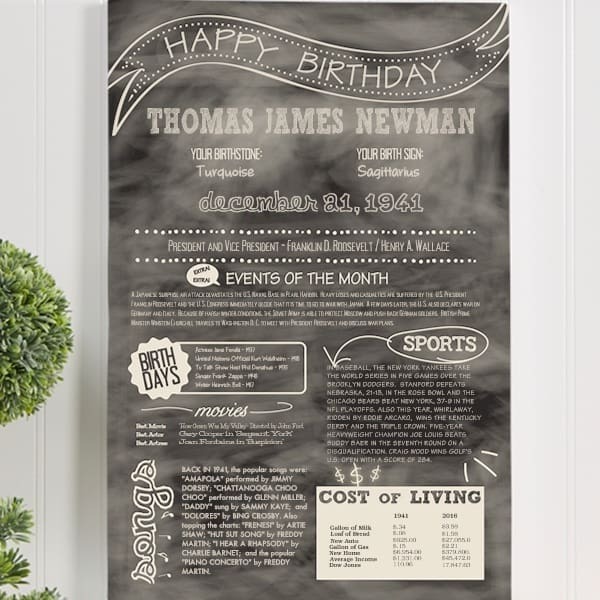 One of our top sellers, this unique canvas sign is personalized at the top with the recipient’s name and birthdate. It then goes on to chronicle the important news, sports and entertainment events from the year you were born. It also includes the names of celebrities who share your birthday, as well as a cost of living comparison between now and then. A fun gift that’s sure to be a conversation-starter – and a sentimental walk down memory lane!